Head lice are becoming increasingly more common throughout the country. On average, there are between 6 and 12 million reported cases of head lice infestations in the United States. These numbers are rising consistently each year. With so many head lice being passed around, more and more adults are becoming worried about their children. Are head lice causing hives? This is one example that worries parents. To answer that question; yes, head lice can cause hives, rashes, eczema, and other skin conditions. Head lice are troublesome and can certainly cause plenty of annoyance over time. Lice are miniature. Despite their small stature, head lice are known to cause quite the stir. In children who have never experienced head lice, the irritation and constant itch can be quite troublesome and often confusing. Many head lice infestations lead to intense itching, which is often localized behind the ears and at the base of the hairline. 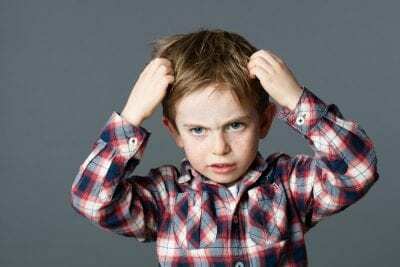 The constant itch, stemming from the bite of the lice, then leads to sores forming, which may become infected with bacteria. 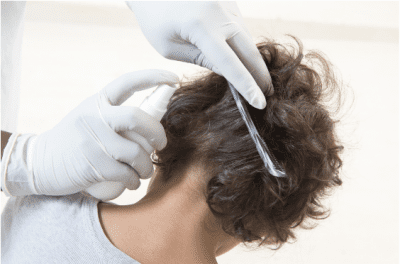 Furthermore, an extended head lice infestation – one not handled properly – will often lead to intense scratch marks, hives, eczema, and rashes along the shoulders and hairline. As clothing rubs against these regions and the itching continues, the situation will only worsen. Head lice feed on blood from the scalp and die without a host. Head lice cannot survive for longer than 48 hours at room temperature without a host. Head lice undergo gradual metamorphosis through three stages: eggs (nits), nymphs, and adults. It takes 7-10 days for a nymph to hatch. If you are worried about hives, then catching head lice early is critical. First, let’s discuss how head lice spread, though. Most commonly, head lice spread via direct head-to-head contact, which is why children are more frequently infected with head lice than adults. Children often receive head lice while sharing clothing, hats, and scarves, or while on the playground, at a sleepover, or at camp. Once head lice have firmly gained ground on the scalp, they begin to feed and lay eggs on the hair follicles. From here, it is a vicious cycle of itching and new nymphs hatching. Your child may be fearful of the entire ordeal. An itchy scalp and bugs? That sounds bad. Add in hives to the equation and you have a troubling ordeal that is bad enough for adults, but likely worse for our kids. From the very moment you spot head lice, schedule an appointment with Lice Lifters at our Frisco location. We provide a welcoming, comforting environment for children suffering from head lice. Schedule professional lice treatment by calling 972-805-1308. We are here for your family in this trying time! There are currently an estimated 6 to 12 million cases of head lice throughout the country. While quite an enormous gap, these millions of cases are not be ignored either. The number of cases is on the rise each year. 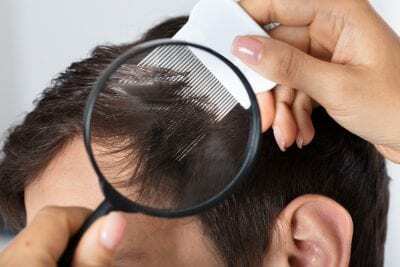 Lice are becoming resistant to chemical medications and shampoos. Only professional treatment truly stands a chance. However, in recent years, hot air has made waves as a lice treatment solution. Does it work? 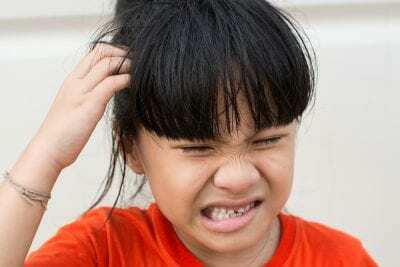 Can hot air effectively kill head lice and treat an infestation? Well, let us dive in and take a look. The only surefire solution, though, is professional head lice treatment. Of course, whenever a brand new lice treatment solution hits the market, everyone wants to study the results and understand how the procedure works. For hot air, multiple studies in the past few years have shown that the right amount and temperature can kill head lice and eggs in just five minutes. In that time, the scalp must be exposed to temperatures between 122-degrees Fahrenheit to 131-degrees Fahrenheit. One study focuses on schoolchildren, aged six or older, with head lice. Live lice and many eggs were combed out and collected. Each child was then treated with varying degrees of hot air treatments. Then, the eggs and lice were combed out once more. The treatment took around 30 minutes to complete. The result? The hot air was able to kill many lice and eggs, however, not all. Many children still had a high probability of re-infestation, so It is certainly not a guaranteed solution. As mentioned previously, the only surefire method to stop head lice in their tracks is to either combine a hot air treatment with professional head lice treatment or to simply undergo professional treatment alone. You have options. When it comes to professional head lice treatment, experts today, such as those at Lice Lifters, utilize safe, non-harmful treatment options. Today’s head lice are quite resistant to the common chemicals found in so many over-the-counter medications. Furthermore, such “medication” does not solve the problem in any case. Most tend to cause intense rashes, headaches, and fever in children. The skin irritation alone is not worth the trouble. Beyond that, you still have head lice. The best option is professional head lice treatment appointment. You will require a follow-up at-home treatment to ensure the head lice do not return, nor do any eggs hatch and cause further troubles. For professional head lice treatment that is guaranteed to treat the problem, consider Lice Lifters in Frisco. We can have you in and out of our office promptly, free of head lice and of an itchy scalp. No more discomfort, no more bugs, just a simple, all-natural solution. Schedule an appointment with our lice experts by calling 972-805-1308. We are here for you, your family, and anyone who has endured head lice for too long! Slapping on some over-the-counter lice removal product and forgetting about the problem is a terrible way to eradicate head lice. Head lice can be extremely stubborn, and if you aren’t careful, they can come back time and time again. To make sure you’re truly treating the lice and preventing them from returning, here are some important things to know. Although some products claim to kill and remove lice without a comb-out, they don’t. These options typically aren’t the most efficient way to banish head lice for good. Purchase a metal comb that’s designed to pick out nits and eggs from the scalp. This will help remove a majority of the lice and nits and ensure that none are hiding between hairs. The process of combing out head lice might be unpleasant, but it’s a necessary step. Removing the lice and nits you can see is only part one of the lice removal process. You’ll also need to use a product that stops the creatures in their tracks and prevents them from returning. Be wary when shopping for lice removal products in stores; many contain harmful chemicals that can irritate scalps and even cause headaches and nausea. In addition, super lice have become resistant to these products, so they’re no longer effective against this new, stronger form of head lice. It’s best to use lice removal products that contain natural but effective repellents. 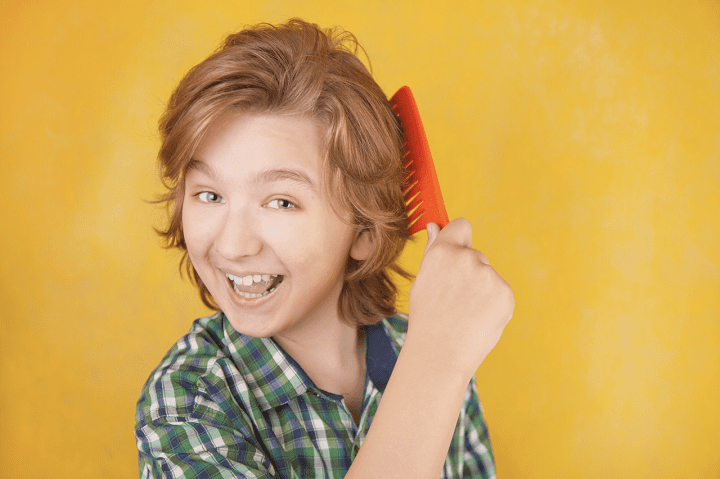 To make sure the lice don’t make a return appearance, plan to use a follow-up treatment. Additionally, check the rest of the family to make sure the lice haven’t chosen a new head to infest. Find a recommended care regimen and stick to it, even it seems like the lice have vacated your home. It’s always better to be safe than sorry, right? By scheduling an an emergency lice removal appointment with Lice Lifters Treatment Centers, you can accomplish all of these steps at once. The professional lice removers will use an all-natural killing agent to put an end to lice activity. They will also conduct a thorough comb out and provide an easy post-treatment plan you can follow at home. Visit one of the two treatment centers, located in Frisco, as soon as you encounter a lice infestation. The expert Lifticians will eradicate the head lice quickly and get you back to your normal life in no time. Call today to schedule an appointment with Lice Lifters Treatment Centers in Frisco at 972-805-1308.